The Buddhist path of awakening has primarily focused on individual transformation as the “place” of enlightenment, even if the awakened One is committed to Saving All Beings.” The spiritual friend or community can be a necessary support to awakening, but the individual mind or heart or consciousness is the location or center of enlightenment. With the Buddha’s departure and Yasodhara’s growth in spiritual community, “a split in the path was forged”—a split that has been furthered by the way the Buddha’s teachings have flourished in the world. Patriarchal traditions seem to have fostered this prioritizing of the internal, individual opening to the spirit. This doorway can eventually open to a full engagement with all of life and humanity, but the possibility of the human-to-human relational opening, and the doorway to the spirit within particular relationships and com­munities, remains the more obscured, undeveloped, and uncharted path. 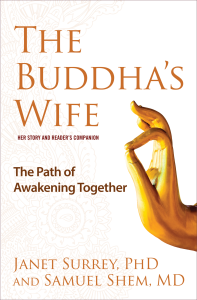 The Buddha’s Wife offers a possibility of healing the split, imag­ining into a shared inclusive path where all voices (male and female, monastic and householder, black and white, East and West) can be included and flourish. Many doorways, one path. Some may argue that the Buddha’s path is beyond all divisions and represents a universal path. We do believe that the Buddha saw the whole beyond the divisions—the “co-arising” of all things. How­ever, the establishment and maintenance of the teachings have been transmitted over centuries, primarily through Asian, male, monas­tic communities. As the Buddha’s teachings come to the West, the infusion of different voices—the sensitivity toward and the inclusion of women, people of color, different classes and sexualities, diverse ethnic and cultural groups—has begun. In this endeavor, careful and precise attention is called for. And so are boldness, courage, and creativity.